Being a personal trainer is a tad more difficult than people think. You definitely have to switch off between using the paint brush and lab-coat as tools since you’ll bounce around between the art and science of personal training. Focus too much on the science and clients will enjoy watching paint dry more than they do your lectures. But an over emphasis on the rah-rah portion leaves the client with lackluster results. Not all trainers are created equal, and it takes time to become really good at educating clients while keeping them motivated at the same time. Here’s six signs that you may need to consider dropping your trainer. Hard work pays off. Well, it should pay off assuming that you’re honest to your training program and aren’t spending your evenings getting mugged by pizzas. If you’re doing everything your trainer says and months have gone by without any form of results, then it’s probably time to move on. I’m not saying your trainer should get you into “magazine cover shape” within two months, but pounds and inches should drop while the weights lifted ought to go up. I once worked with a nice young man who came to me with the desire to gain muscle mass. 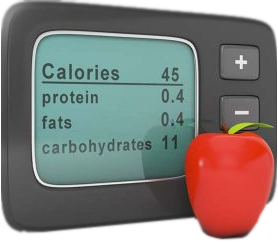 That was the initial goal – but after the first six weeks, he had a bit of reality check and realized how involved it can be in terms of prepping food and eating enough calories. He did gain 7 pounds in those six weeks, but he found that simply getting stronger and learning Olympic lifts is what really lit his fire. While an awesome before and after would have been great for business, I had to make sure to focus on what the client wanted – which was getting stronger. Some trainers try to “convince” their clients what they should be doing, which is a big no-no. As long as what the client wants is reasonable to achieve and important to them, the trainer should lay out the blueprint. Number 1 lacks an understanding of human science, while number 2 simply assumes that what worked for them will work for the clients. Age, gender, training experience, genetics, and nutritional status all play a role in someone’s fitness. People are different individuals and need to be trained that way. Clients need help, support, and guidance. Some trainers though love the mirror, and they spend their client’s session talking more about themselves than they do the client. I’ve worked with other trainers and overheard their conversations and it’s definitely all I,Me,Mine when it comes to conversation. While small talk is nice (I’ve had some great conversations with my clients….after the workout), clients should hear about their training, their progress, as well as having their questions answered. The last thing a trainer should do is to bum their clients out with a ton of self-talk. Everyone has seen the trainer that carries a whistle and wears fatigues. 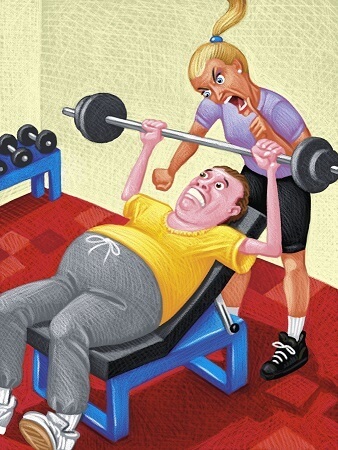 It looks cute but doesn’t really apply – a good trainer is a good coach, not someone hell bent on intimidation. Working out should be a rewarding experience based around pushing your limits and building self-confidence. The last thing you want to do is treat physical activity as a form of punishment. Counting tempo, watching form, and providing coaching cues help a client build their training skill set. A trainer droning on and on about their own problems or just flat out not paying attention doesn’t help you. I’ve seen trainers work with clients and literally send a text while the client works out. I’ve also worked out in public gyms and seen trainers having a conversation while their clients were training. Not exactly a great learning environment. Imagine if your kid’s elementary school teacher spent class time on Facebook and playing video games. Test your trainer – print up these list and use a red pen to make any notes. If your sheet ends up having more red ink on it than black, then it may to time to reconsider your options. If your personal trainer isn’t giving you the attention you deserve, it may you need to hire a personal trainer in Novi Michigan!